Please Note: Any cancellations must be made at least 24 hours prior to workshop in order to receive a store credit or full refund. 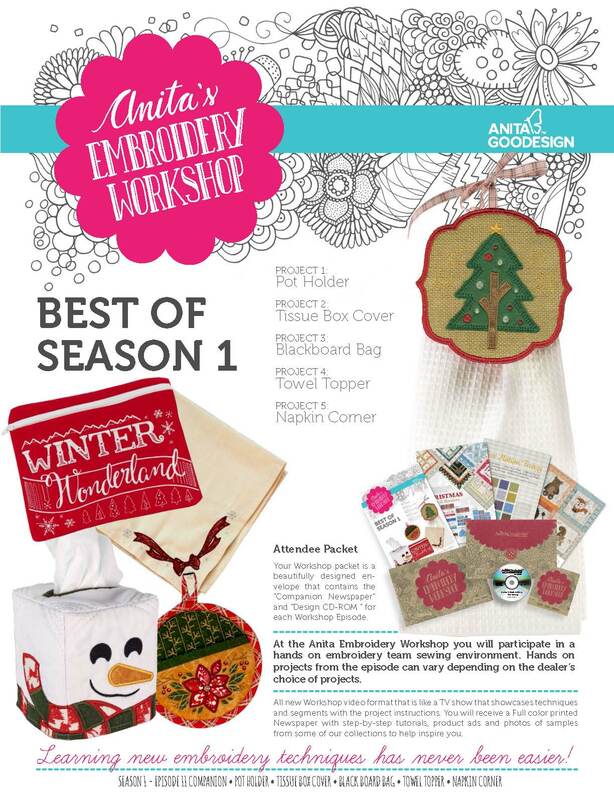 The exclusive monthly workshop packets and embroidery designs are only available to the people that register and attend that month’s Anita Goodesign Workshop. We are making an in-the-hoop, Towel Topper! I love this project because we are actually putting elastic onto the back of the topper while in-the-hoop…. This means it’s not permanently attached to the towel! Yay!!! 5.6″ Wide – 5.6″ High. If you have signed up for this month’s Anita Workshop, you will be receiving an email with a temporary link to download the design before class. If possible, please download the design that will fit your hoop and load it onto your machine before class. See you Awesome Ladies SOON!!! I’m not sure how well Peltex will stitch out for this project. We will have Floriani Stitch n Shape for sale by the sheet at $3.50 each. I’m unable to attend class Dec.19th, unexpected family arrived few hours ago from out of state.. Please save my packet will pick it up on Monday or Tuesday. I have not seen an email with the design to download yet. I haven’t, either. I guess we’ll get them tomorrow. Things have a way of working out at Humble Sewing Center — they’re awesome! Silly me — they were in the link, “Towel Topper!” Thanks, Jenny!